I understand how frustrating it feels when you keep doing your best but your weight scale still doesn’t go down. All your workouts and diet plans might not affect the weight scale if you are doing a few things wrong. It could be that the scale hasn’t budged for one week or six, and I know just how frustrating that can be for you when you are trying everything to get the weight off. It is time to stop beating yourself up and please, whatever you do don’t give up! You are not alone and it is time we talk about 6 weight loss tips that could be having an impact on the number on the weight scale. Our body needs way more potassium than sodium. However, usual diet plans don’t emphasize the fact that extra sodium can cause various diseases along with rigidity in weight loss. Increased sodium consumption holds fluids in the body. This increases the weight, showing no positive result in the weight scale. A fast metabolism increases your excreting process, usually right after we eat something. The faster you poop the healthier your body is. If the food is contained in your stomach for a long time it can end up increasing your belly fat and the scale might not go down but up! You can learn more about your fast or slow metabolism here. One quick tip if you think this could be part of your problem is to add some green tea into your day. Often during periods our overall body weights increases. This isn’t just something girls say or something that is in your head. This can be due to swelling or any hormonal imbalances, resulting in no drop when you hop on the weight scale. It is always recommended to weigh your body at the same hour of if you weigh yourself each day. Your body usually increases or decreases in weight during different parts of the day. This is often referred to as weight fluctuating. For example, your body weight might be slightly more in morning as compared to other parts of the day. If weighing yourself is important to you, make sure you weight yourself at the same time to get a true gauge. If you are following a diet plan to try and lose weight it is important the amounts of foods you eat is somewhat similar. Unless we want to talk about carb cycling, you will want to try your best to find and maintain a balance when it comes to your carb intake. If you keep changing the ratios of carbs every other day, you might end up being discouraged in the short term with what the weight scale has to say. While we are on the topic of carbs, here are 6 carbs to add to your diet to help you lose weight. Often kidney and derma medicines retain water in our body. If you are taking any medicines, consult with your doctor about the water they retain. These medicines could be the reason why you are not noticing any weight loss. In short, big steps like giving up on processed unhealthy food and exercising are important. But paying attention to small details is equally important. Sometimes when you are looking for bigger reasons, it is the smaller things that can be a hurdle in your way to weight loss. 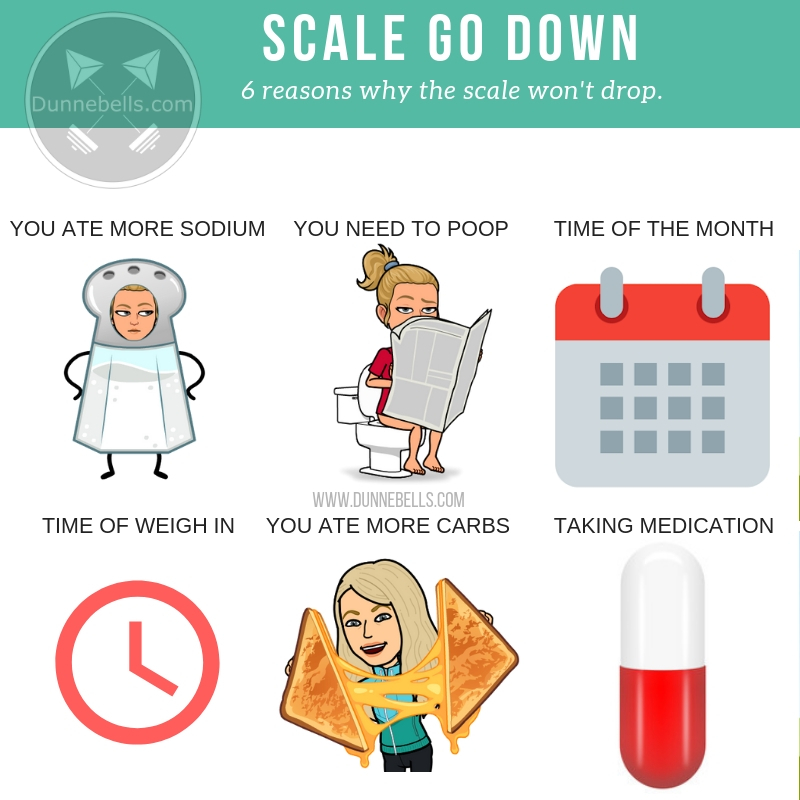 Are you a scale addict? I am a recovering one. Luckily I have lots of pictures documenting my weight loss of 65 lbs because the number on the scale isn’t nearly as important as the physical changes. Like anything fitness related, if the scale is working for you stick with it. If the number is leading you to unhappy feelings, consider stepping off and taking a break. It will always be there for you when you are ready for it again. Thanks to an anonymous donor, My friends at Goodpin have partnered with United Way of Calgary and Area to flip #blackfriday on its head! You can give $20 to a cause you care about - for FREE! Visit good.calgaryunitedway.org , select your cause, and help us solve #unignorable local issues! Share your chosen issue and get your friends and family giving back to the causes they care about too! Get to it! Be the fire.